This review is based on published literature as well as consultations and field visits to Lao PDR in 1996 and 1997. Styrax tonkinensis is a deciduous tree up to 25 m tall and 30 cm in diameter with a clear bole for about two-thirds of total tree height. The bark is generally gray, smooth, and 6-9 mm thick when young, but becomes brown and rough with longitudinal fissures with age. Trees are light branching, with branches more upright towards the top. Young trees have a dense crown which occupies up to two-thirds of tree height. Trees reach sexual maturity at 4-5 years of age. Flowering and fruiting times vary with location. Flowering usually occurs in May to June (sometimes until July), and fruit matures from September to November. When fully mature, each tree produces up to 40 kg of fruit per year. Each 2-3 kg of fruit contains 1 kg of seed. There are 8,000-9,000 seeds per kg. The natural distribution of S. tonkinensis in Lao PDR encompasses the northern provinces of Phongsaly, Luang Namtha, Oudomxay, Luang Prabang and Houaphan, between latitude 20-22°N and longitude 101-105°E. The distribution also extends into the northern provinces of Viet Nam. In Lao PDR it occurs predominantly at 800-1,600 m elevation. Mean annual rainfall over most of its distribution ranges from 1,500 mm to 2,200 mm with only a few dry months. Mean annual temperature is from 15°C to 26°C. S. tonkinensis is light demanding; in open, burned-over areas it often occurs in the upper story. The extension of the natural range of the species owes a great deal to human activities and its pioneer characteristics - the demand for light and its regular production of large quantities of viable seeds. It may occur in almost pure stands over many hectares. 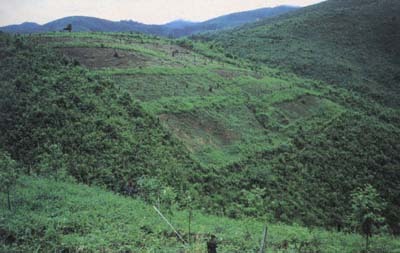 Many stands occupy sites previously cleared for shifting cultivation. Fire promotes and accelerates seed germination. S. tonkinensis regenerates well in gaps, providing the undergrowth is not too heavy, as saplings are sensitive to competition. After this establishment phase, young trees will grow rapidly and dominate the site. In Viet Nam, when harvesting styrax forest for wood, 50-100 styrax trees per ha are left to provide seed. Some treatments (e.g. clearing undergrowth) may be carried out to promote seed germination and seedling growth. Additional seed is sometimes sown. Local people carry out periodic maintenance to retard the invasions of weeds, especially bamboo. In Lao PDR, natural regeneration of S. tonkinensis is a function of the shifting cultivation cycle, but without any systematic silvicultural treatments. Old regrowth styrax forest is cleared and burned at the end of the dry season. Upland rice is sown at the beginning of the rainy season, normally in April or May. The styrax fruits, which fall during the clear felling, germinate in the rainy season and the dense seedling growth is thinned to about 500-600 stems per ha during weeding. It is harvested 4-6 months after sowing, depending upon the variety. Rice is grown for only a single season because the yield declines significantly if it is replanted in the following season. 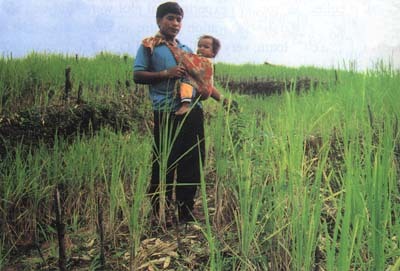 The harvested rice crop is chiefly for subsistence with any surplus bartered for other goods such as salt and kerosene. After the harvest, the plot is left untended and becomes very dense with a diversity of undergrowth competing with the styrax trees. In Nam Bak district, Luang Prabang province, benzoin tapping from styrax trees is initiated in year 6-7 and continues for 3-4 years or until production declines. The whole stand is then cleared and another cycle of regeneration begins. Until less than a decade ago, the age at which old regrowth forests were cleared for rice cultivation was greater than 10 years, sometimes up to 14-15 years. This tradition has changed in recent years due to rapid population growth and the pressures exerted by villagers who need land for rice cultivation. Now more often, styrax forests are cleared at a much younger age and before the trees reach their full potential age for benzoin production, i.e. 7-8 years old. Often stands as young as 5 years old are cleared. This results in the loss of an important source of household income from benzoin tapping. However, in more remote areas, this change is less predominant. A comprehensive review of the silvicultural systems of S. tonkinensis in northern Lao PDR and Viet Nam was compiled by Pinyopusarerk (1994). The review revealed that there are no structured systems employed in Lao PDR; most styrax stands are the result of natural regeneration subsequent to the shifting cultivation cycle. In Viet Nam, silvicultural practices have been well developed and large areas of plantations have been established. However, assisted natural regeneration is also practised, though to a lesser degree. Viet Nam is the only country known to be carrying out large-scale planting of S. tonkinensis; over 20,000 ha have been established. Silvicultural practices in Viet Nam have been documented by Lam Cong Dinh (1964), Le Quang Dang (1966), Hoang Chuong (1974), Doan Van Nhung et al. (1978), Nguyen Ba Chat (1979) and Anon. (1983). These authors describe techniques ranging from seed collection and handling, nursery propagation to field establishment and management. The following discussion of practices in Viet Nam is based upon the above citations. Seed is not collected from the ground but picked from the tree because fallen fruit has poorer germinative capacity. In general the seed harvest period is from October to November. Ripe fruit is characterized by: 1) a silvery colour with pale white spots on the outer coat; 2) splits at the top of the fruit; and 3) a dark brown seed coat. Storage of S. tonkinensis is not required if fresh seed is to be sown. If seed sowing is not anticipated within a few months after the collection, proper storage must be followed to preserve viability. Maintaining the moisture content of the seed at 30% has been recommended. The simplest method is to put the seed in running water or store it in a mixture with wet sand (1:1 ratio) and place the mixture under shade with good ventilation. Seed may be stored under this condition for up to 1 year by turning the mixture once a month and keeping the mixture moist by frequent spraying with water. Plantations are sometimes established by direct sowing of five to seven seeds into a prepared hole. The germinated seedlings are thinned to leave only one plant per hole. However, this method is uneconomic and a lot of seed is wasted. Planting with nursery-raised tubed seedlings is a more common practice in Viet Nam. Seeds are sown onto germination beds, which are kept continually moist during the germination period. Fresh seeds germinate within 2 weeks. Germinated seeds are transplanted, when the cotyledons have fully unfolded, into tubes containing loamy forest soil and river sand (1:1 ratio). They are protected from full sunlight until the first two seedling leaves appear. The seedlings should be kept in the nursery for three months before out-planting in the field. Planting stock prepared from seedlings raised in nursery beds for 10-12 months is sometimes used for plantation establishment in Viet Nam. Seedlings 1-1.5 m tall and 1-2 cm in diameter at the root collar are removed from nursery beds at planting time. The stem is cut off 3-5 cm above the root collar and some of the lateral roots are trimmed from the tap root. Regardless of the type of planting stock used, site preparation follows the same routine. Ground vegetation is cleared, left to dry and burned. A strip of vegetation 10 m wide is retained around mountain ridges if the slope is 25-30°. Furthermore, if the slope is more than 100 m in length, additional 5-10 m wide strips of vegetation are retained, with spacing of 50-100 m, following the contours. Various initial planting densities are used in Viet Nam, depending on the site quality, planting stock and demand for wood. These densities are: 1) 1,600-2,000 stems per ha where the soil is fertile, well drained and not subject to erosion; 2) 2,000-2,500 stems per ha if the soil is relatively fertile and well drained but may be subject to erosion; and 3) 2,500-3,300 stems per ha in cases where soil fertility is low and there is poor drainage or erosion anticipated. The high density is also suitable where the demand for fuelwood and small wood is high. In the first two years, styrax plants are ideally kept free of weed competition by regular removal of adjacent ground vegetation. For older plantations, maintenance generally consists of clearing climbers and unwanted surrounding vegetation on an as-needed basis. The main objective of fertilizer application is to promote early growth and a uniform plantation tree population. Nitrogen fertilizer should be applied immediately after out-planting to help the new seedlings establish themselves within the shortest possible time. The recommended application rate is 60 g N of fertilizer per tree, divided into three applications of 20 g each. Thinning forms part of the routine management in styrax plantations because of the high initial stocking rate at establishment. Two to three thinnings may be required before the plantation reaches the minimum rotation age of 10 years. Final stocking density is generally 600-800 stems per ha. S. tonkinensis is fast growing and under favorable conditions can attain annual height increments of 3 m during the first three years. A mean height of 18-25 m and DBH of 20-24 cm are obtainable at 10 years (Thai Van Trung, 1975). Such growth would give a wood yield of about 150 m3 per ha based on final stand densities of approximately 600-800 stems per ha. A defoliator, Fentonia sp. (Lepidoptera: Notodontidae), is reported to damage thousands of hectares of S. tonkinensis plantations in Viet Nam (Le Nam Hung, 1990). Control by chemical sprays has been recommended during the outbreak. An unidentified stem borer has also been observed on many trees growing in Nam Bak district, Luang Prabang province of Lao PDR. There are indications that genetic variation in S. tonkinensis may exist. Benzoin production has been observed to vary with the individual tree and according to elevation (Druet, 1924; Lam Cong Dinh, 1964). Trees growing at higher elevations are reported to produce more benzoin than those growing at lower elevations. Furthermore, styrax cultivators in Lao PDR and Viet Nam have observed that more benzoin is obtained from trees having dark brown, thick and rough bark than trees having light-coloured, thin and smooth bark. It is not known whether this difference is related to elevation, or if it is simply a matter of differences between small and large trees. There have been no systematic studies of the genetic variation in S. tonkinensis. The only evidence of such an attempt appears to be in a report on a small provenance trial in Viet Nam (Nguyen Thai Ngoc, 1989). That study, however, compared only three sources from a narrow range in Viet Nam and did not show significant provenance differences. In light of the observed variation in yield of benzoin between different individual trees and elevations, it is appropriate that a systematic assessment be made to confirm such a variation if it exists. Given the availability now of effective and rapid methods of chemical analysis, and relevant precedents provided by research on other species, there is a real possibility that varieties of S. tonkinensis with high yields of high quality benzoin could be quickly developed through a tree improvement programme. Improved production of benzoin through identification of superior seed sources and improved silvicultural management techniques will provide a variety of benefits. Villagers will be better off economically. Increased benzoin production per individual tree means that the land area required to produce the same quantity of benzoin is less, thus allowing more land area for cultivation of subsistence and cash crops over an extended period, and reducing the pressure on villagers to open up more natural forests. An improvement programme for any tree species is, however, costly to implement, takes a long time to obtain meaningful results, and requires a continuing commitment of skilled staff. Therefore, careful consideration must be exercised before embarking on a potentially costly tree improvement programme. In particular, the benefits and costs of such a programme must be clearly analyzed. Two provenance trials, each consisting of 12 seed sources, were established in Nam Bak district in July 1997, the first at Ban Kachet (800 m) and the second at Ban Thali (400 m). 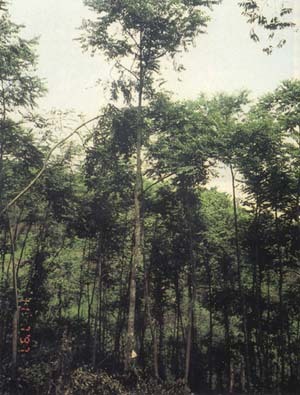 The Ban Kachet trial site was cleared of ground vegetation without burning in May 1997. The plot was used to plant one crop of upland rice in the 1996 season. Marking out of the trial was done as follows: 1) block corners were marked with large wooden posts (15 cm diameter); 2) plot corners were designated with small wooden posts (10 cm diameter); and 3) planting positions were established with bamboo sticks. The Ban Thali site was cleared of brush and burned at the end of May and early June. This was followed by marking out in a similar fashion to that for the Ban Kachet trial. Both trials were fenced with three strands of barbed wire to keep out livestock. The experimental designs for the two provenance trials were based on 12 provenances in four replicates, 25 (5 x 5) trees per plot and 3 x 3 m spacing. The total area of each trial was 1.5 ha. Different experimental designs were employed. The area at Ban Thali permitted all replicates to be kept together in one rectangular block. A latinized row-column design (Williams and Talbot, 1993) was used for this site. The 12 provenances were arranged in two rows of six plots each, and the four replicates were staggered on top of each other (see Figure 4.1). For the trial at Ban Kachet, due to the steep, mountainous terrain, it was not possible to keep all four replicates together in one rectangular block. 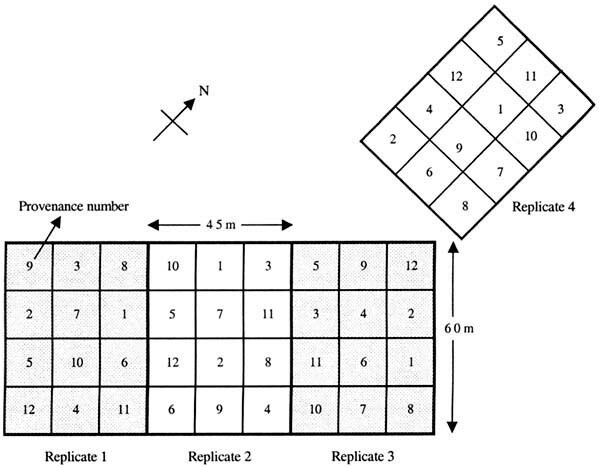 As a result, a decision was made to use a row-column design (Williams and Talbot, 1993) where the first three replicates were kept together and separated from the fourth replicate. 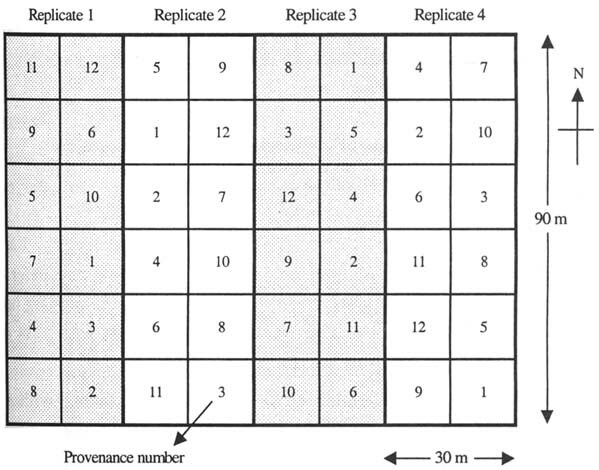 In this plot, the 12 provenances in each replicate were arranged in three rows of four plots each (see Figure 4.2). The Ban Kachet trial was planted on 1-2 July, and a few days later the Ban Thali trial on 5-6 July 1997. Seedlings were planted in pre-dug holes 25 cm deep and 25 cm wide. The weather was overcast with light rain throughout the whole planting period. Planting was carried out under close supervision, starting with one replicate and worked through all the 12 plots (seedlots) before beginning the next replicate. Seedlings in one plot were planted before commencing the next plot. All plots in the same replicate were planted on the same day. Two replicates were planted in one day. A starter-dose of fertilizer (NPK 16:20:0), 50 g for each plant, was applied within one month of planting. The fertilizer was dug in 15 cm from the plant on both sides across the slope. Fertilizer application is aimed at uniform establishment of seedlings at the initial stage. Dead or badly desiccated plants were replaced with surplus stock of the same provenance. Crickets (Brachytrupes portentosus) were observed to nip the stem of a few plants. An initial survival check 10 days after planting indicated that the replacement of dead plants would be minimal. Dry grasses and other herbaceous plants were cut and removed from the experimental area at the beginning of the dry season. The trial at Ban Thali was deemed to require possibly extra care during the dry season; firebreaks are recommended for this site. Controlled burning was not recommended, as the styrax plants were still too young. Three weedings were anticipated in the first two years. Subsequently, the frequency of weeding was to be on an as-needed basis. Provenance trials are generally long-term in nature and require at least one half to two-thirds of the species rotation to obtain reliable results. The S. tonkinensis provenance trials were planned to run for seven years during which two types of data would be collected: 1) growth (height and stem diameter); and 2) benzoin production. The frequency of measurements is provided in Table 4.1. Height refers to the total tree height to the nearest 1 cm at the 6-month and 1-year measurements, and to the nearest 10 cm from year 3. Diameter at breast height refers to the stem diameter taken at 1.3 m from ground level and is measured to the nearest 0.1 cm. Benzoin yield for each tree will be measured with a reliable scale to the nearest 1 g. The best tapping method, which will be based upon results from processing research, will be employed, otherwise the Lao traditional tapping method will be used. The same tapping intensity (i.e. number of cuts) will be made in each tree. A qualified laboratory should be contracted to carry out chemical analysis of the benzoin. It is possible that the chemical constituents may vary among the trees within and between provenances. A data collection form was designed for the S. tonkinensis provenance trials. The form was organized in such a way that the data for each plot of 25 trees fits on a single page. Additional data from subsequent measurements can be updated on the same data sheet corresponding to each respective plot. The origins of the seed planted in the trials are given in Table 4.2. The survival rates of seedlings in the trials varied among provenances and between planting sites. Table 4.3 summarizes the survival of the provenances at both sites three months after planting. The trial at Ban Kachet (the higher elevation site) had less than 10% mortality while that at Ban Thali (the lower elevation site) suffered approximately 30% mortality. All 12 provenances in the Ban Kachet trial had a good-to-excellent survival rate, with provenance means ranging from 82-99%. It is interesting to note that a local provenance (No. 3 Ban Kachet) had one of the two lowest survival rates (mean 83%). The other poor surviving provenance, No. 5 Nam Miang (82%), was also from Nam Bak district. Although the trial was fenced with three strands of barbed wire, village goats had managed to slip through causing some deaths amongst the plants. At Ban Thali, all three provenances from Nam Bak district (Nos. 3, 4 and 5) had very poor survival rates (54-68%). Other poor surviving provenances included Phu Ninh, Viet Nam (No. 2). The best provenances in terms of survival were those from Houaphan province (Xam Nua, 84%, Xam Tai, 90%). It should be noted that barbed wire on the western side of the experiment (Replicate 1) was stolen twice over two months. Before the missing barbed wire could be replaced, many plants on that side had been damaged by cattle and this might have resulted in a higher mortality in Replicate 1. Nevertheless, overall survival at Ban Thali (72%) was poorer than that at Ban Kachet (92%). Crickets were observed to bite off the stem of newly-planted seedlings at both trial sites, causing some plants to die. A general observation on height growth in the provenance trials found clear differences among provenances. The fast-growing provenances appeared to be those from Houaphan province. All three provenances from Nam Bak and two provenances from Viet Nam were among the slower growing seed lots. With a few exceptions, the provenances which had good survival also tended to grow well. The first height growth measurement of the trials was carried out at age 6 months after planting in January 1998. The result of this measurement is shown in Table 4.4. The latest findings of the provenance trials are described in Appendix 5. One agroforestry trial using the alley-cropping system was established at Ban Kachet. Rice and peanuts were inter-planted between rows of styrax seedlings. Soil samples collected from the experimental plot were analyzed by the Soil Survey and Land Classification Centre in Vientiane. The soil texture is loam to clay loam, very acidic, pH (H2O) 4-4.5. The top 10 cm of the soil is moderately high in organic matter but very low in available phosphorus. Survival and growth of the styrax plants in the agroforestry trial were poor, with more than 30% of plants being found dead or severely damaged. Crickets, village goats and poor root development of the seedlings were reported to have contributed to the high mortality. In order to maintain a full coverage of styrax trees in the trial, direct sowing of five or six seeds into each empty planting hole was carried out. Where styrax seedlings survived new seeds were sown at 20-25 cm away from the seedlings. Seed was collected from the current crop and sowing was completed in November 1997. 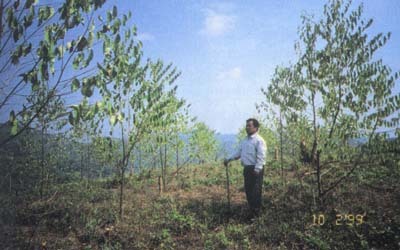 The development of the old and new seedlings was assessed in February or March 1998. The upland rice crop was also performing poorly and the yield was very low. According to the comments of villagers at Ban Kachet, inadequate site preparation and late sowing of rice seed may be the key factors contributing to the poor performance of the rice crop. Preparation of the experimental site was behind schedule due to a shortage of casual labourers because Ban Kachet villagers were busy working in their own farms. As a result, the experimental site was not burned after ground vegetation was slashed. The first peanut crop, which was harvested in September 1997, was reported to be satisfactory. The second peanut crop was sown at the end of October. The latest situation of the agroforestry trial is described in Appendix 5. Photo 4.1 Natural regeneration of Styrax tonkinensis in the rice field under shifting cultivation at Ban Kachet. Photo 4.3 The agroforestry trial plot at Ban Kachet. The small trees seen in the near front are young styrax seedlings in the provenance trial plot. Photo 4.4 A mature styrax tree in a naturally regenerated stand, Ban Kachet.